WASHINGTON (CNN) - The House hearing with FBI agent Peter Strzok erupted into a shouting match Thursday afternoon after Texas GOP Rep. Louie Gohmert directly asked Strzok about his affair with former FBI attorney Lisa Page. As Gohmert went through his speaking time at a hearing on Thursday with the agent accused of anti-Trump bias, the Texas Republican sparred with another lawmaker, who called his statements a "disgrace." This prompted Gohmert in turn to raise his voice, turn to Strzok and say, "No, the disgrace is what this man has done to our justice system." "There is the disgrace," Gohmert said. "And it won't be recaptured anytime soon because of the damage you've done to the justice system. And I've talked to FBI agents around the country. You've embarrassed them. You've embarrassed yourself. And I can't help but wonder when I see you looking there with a little smirk, how many times did you look so innocent into your wife's eye and lie to her about Lisa Page?" The last part of comment, referencing the extramarital affair between Strzok and Page, prompted jeers from others on the committee, including one person who could be heard saying, "This is outrageous." "You need your medication," said New Jersey Democratic Rep. Bonnie Watson Coleman. New York Rep. Jerry Nadler, the top Democrat on the House Judiciary Committee, said he thought it was against House rules to impugn the character of a witness. Virginia GOP Rep. Bob Goodlatte, the House Judiciary Committee chairman, said the rule only applies to members of Congress and the President. Goodlatte then tried to let Strzok respond to Gohmert's statements after the Texas Republican's time ended. 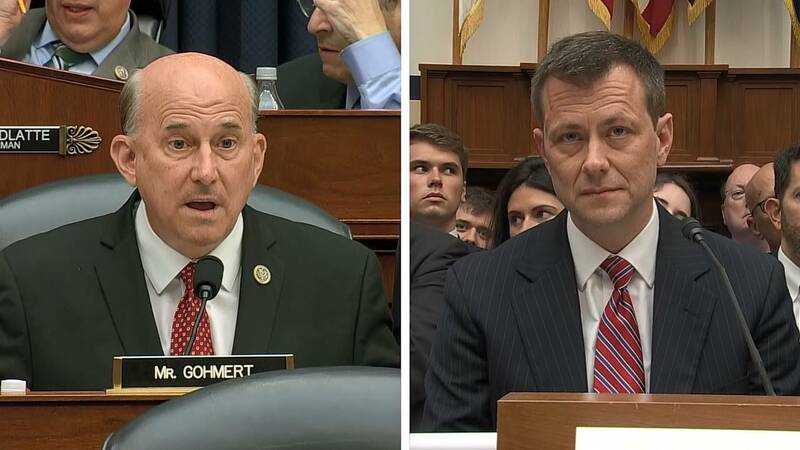 As Strzok began to talk, Gohmert tried to prevent Strzok from speaking again, saying he had not asked him a question. Goodlatte let the embattled FBI agent go ahead anyway. "I have always told the truth," Strzok said. "The fact that you would accuse me otherwise, the fact that you would question whether or not that was the sort of look I would engage with in a family member who I have acknowledged hurting, goes more to a discussion about your character and what you stand for and what is going inside you." At this point, Gohmert cut back in, and the two spoke loudly over one another.